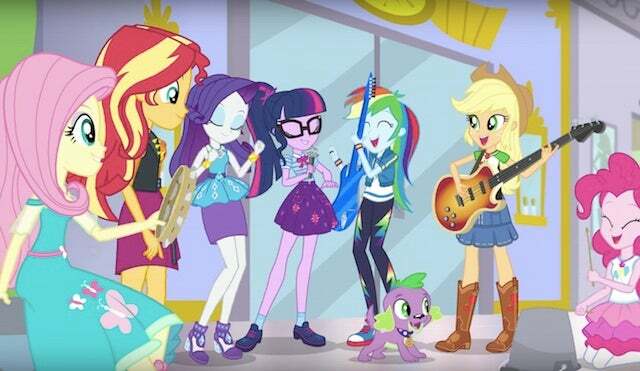 Hot on the heels of a theatrically-released movie, Hasbro's My Little Pony franchise continues throughout the year will premiere the first episode of its brand new My Little Pony: Equestria Girls series on YouTube -- and ComicBook.com has an exclusive first look at the trailer. Fans can expect more than 45 new episodes from the series starting on November 17 (presumably as perfect counter-programming to The Punisher and Justice League), with a new episode rolling out each Friday following the premiere. The magic of Equestria cannot be contained! It’s found its way into the world of the all new My Little Pony Equestria Girls Digital Series and it’s turning everything on its head. From afterschool clubs to beach days, music festivals to theme parks, and a rockin’ Spring Break on a yacht, magic is sure making things interesting. Join Sunset Shimmer, Twilight Sparkle, Applejack, Fluttershy, Pinkie Pie, Rainbow Dash, and Rarity as they learn what it means to be superheroes while they take on their biggest challenge yet: high school. In addition to the new TV series, Hasbro is releasing a brand new line of My Little Pony: Equestria Girls fashion dolls. In partnership with Laura Shuffman, the official My Little Pony: Equestria Girls celebrity stylist, Hasbro revamped the dolls’ looks from the previous collection, adding new, highly fashionable outfits for all of the Mane 7! The look of these new fashion dolls inspired the look of the characters seen in the upcoming My Little Pony: Equestria Girls series. The new Equestria Girls fashion dolls line will be available for purchase in the U.S. in December 2017 and globally beginning in January 2018. You can get a look at the redesigned dolls here.